Suzanne Hollander and Federal Reserve Vice President, Senior Economist and Regional Executive Dr. Tom Cunningham of Atlanta Federal Reserve Bank discuss interest rates, real estate, employment and U.S. monetary policy with over 70 alumni, graduate & undergraduate students on September 30, 2013. Scroll down to learn more! The Federal Reserve is a BIG DEAL! It is the U.S. Central Bank. We discussed how the Fed controls the U.S. money supply and the impact of the Fed’s policy on real estate, employment and national & international economies. Federal Reserve policies also impact you and your wallet! Interest rates are the “rent” you pay to borrow money. Interest rates are now at an all-time low. Investors like this! Low rates encourage people to borrow money and buy real estate! If you buy your first home now, you may qualify for the lowest rates in history! If you buy land, a building or finance a new skyscraper, now you may qualify for the lowest rates in history. The question on investor’s minds is, How long this “good thing” (low interest rates) will last? This question is asked everywhere, from my classroom, to Wall Street, Main Street, U.S.A and major newspapers around the world. The United States Senate is also asking this question to the President’s nominee for the next Chair of the Federal Reserve, Dr. Janet Yellen. The answer will impact real estate supply, demand, pricing and deal timing. It will also impact the interest rates you pay to borrow money. Make sure to follow the discussion in the news so that you time your deals right and make smarter more informed real estate decisions! Contact Professor Real Estate® to Learn Something Real Estate! Contact Hollander Realty, LLC, Lic. Real Estate Broker, for purchases and sales of property – services delivered in a confidential professional business manner. « CREW News! 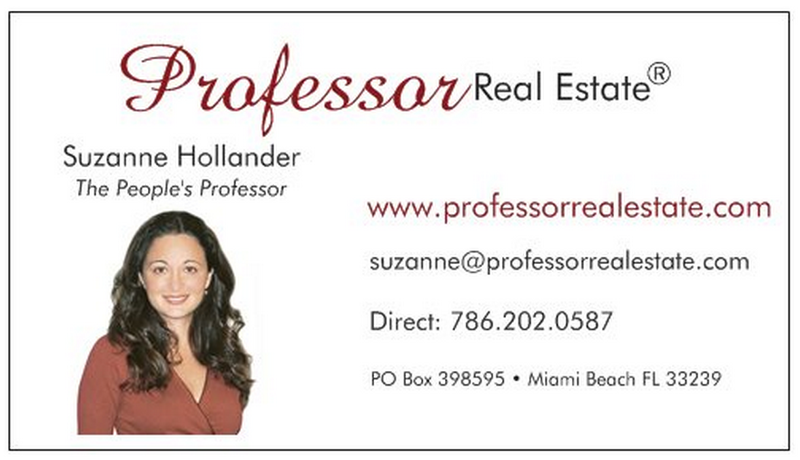 Suzanne Hollander Connects Real Estate Investors, Bankers, Owners, Lawyers & Students!